In May, the average maximum temperature of Sapporo is 17.3 ℃ (63 F)and the average minimum temperature is 8.3 ℃(47 F). It is slightly warm during the day, but cold in the morning and evening. In addition, it is chilly even in the afternoon on rainy days. Please bring a warm jacket just in case. If you wear a blouse and pants in the warm afternoon, you might catch a cold. It will suddenly turn chilly in the evening. 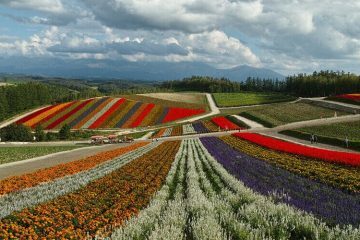 Maruyama Park is a famous place where most residents of Sapporo City have visited at least once. 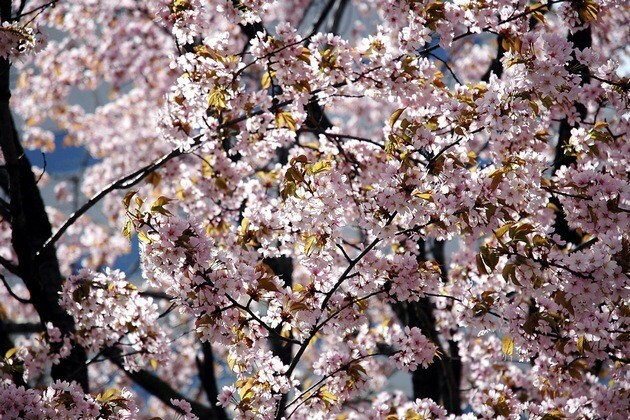 There are about 160 cherry blossom trees on the site of about 68 ha (1 ha = 2.47105 ac). There are huge crowds at the time of full bloom! When cherry blossoms bloom in Japan, there are parties underneath. For this reason, there are people, with drinks in hand, having a good time. You can enjoy the lively atmosphere. 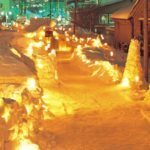 The secret to the popularity of Maruyama Park is its convenient location, 5 minutes away by subway from the central area of Sapporo. 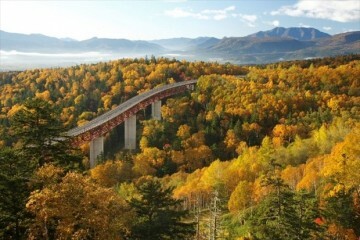 Furthermore, being directly linked to Hokkaido Shrine is also an attractive point. 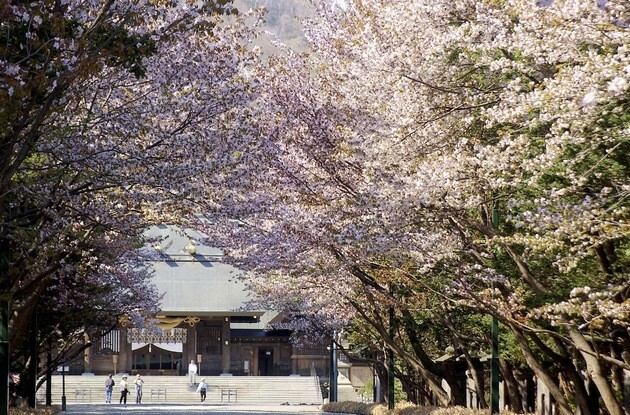 Hokkaido Shrine is also a famous place for cherry blossoms, where 1,034 cherry blossom trees bloom all over in spring. However, as it is a shrine, people do not have parties there and the atmosphere is calm. Directions: From the Subway Tozai Line Odori Station, take trains towards Miyanosawa for 5 minutes, alight at Maruyama Park, take Exit 2, and walk for about 5 minutes. It is just 3 stops from the Subway Sapporo Station. 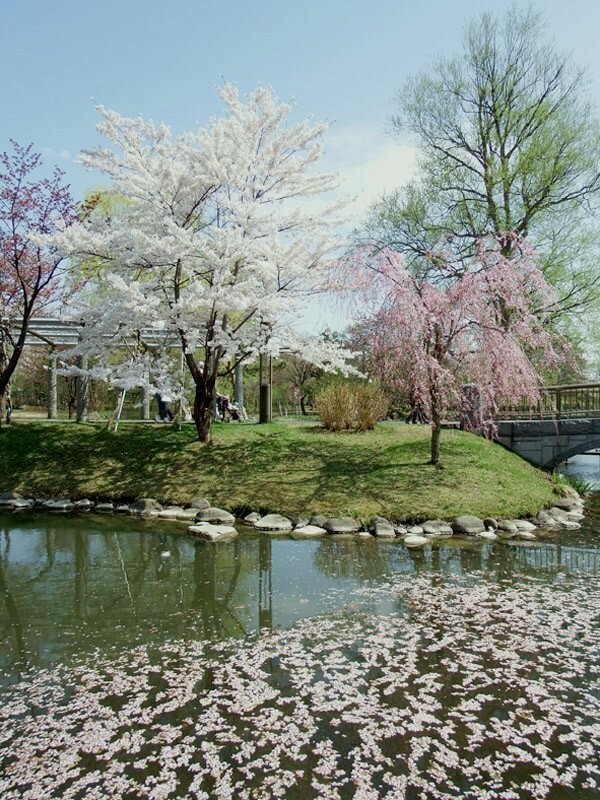 Even though it is located pretty much in the center of Sapporo, you can leisurely view cherry blossoms in Nakajima Park. In the park, various cherry blossom trees such as double-flowered cherry, sargent cherry, and weeping cherry are planted. These are in full bloom at slightly different times, such that any one of these would be in full bloom for a stretch of time. There is a Japanese garden in the west of the park. You can see cherry blossoms here in a pleasant atmosphere! 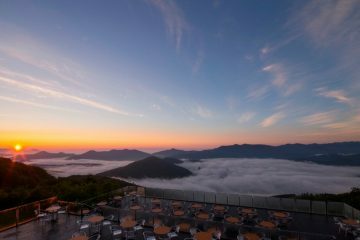 You can enjoy scenery similar to the past Japan , which is different from the present with rows of high-rise buildings. In addition, You can rent a boat and ride on it at the Iris Pond located in the middle of the park. The cherry blossoms near the water are especially beautiful when viewed from a boat. Nakajima Park is famous for the Western architecture named“Hoheikan”， it was built in the Meiji era (1868-1912) when western culture just entered Japan. It is designated as an Important Cultural Property with the exact appearance from the past. It is under construction until June 2016 for purposes of conservation, repair, etc., including renovation for earthquake-resistance. From spring 2017, you can enjoy the combination of the nostalgic Hoheikan and cherry blossoms. Directions: From the Subway Namboku line Sapporo Station, take the train in the direction of Makomanai for 5 minutes, alight at Nakajima Park Station, and it will be just outside Exit 1 or 3. 3. 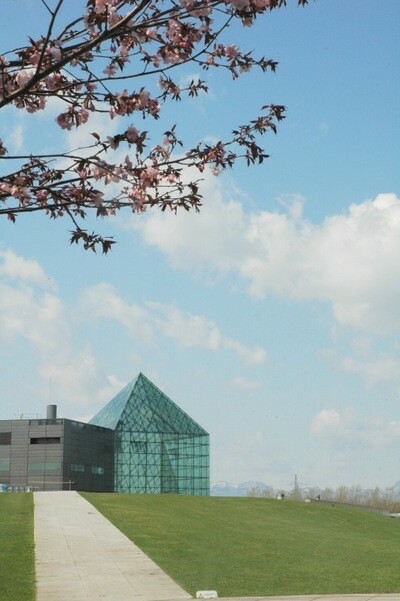 Cherry blossom viewing at Moerenuma Park gives you an amazing experience of expanse! It has large grounds of about 189 ha. 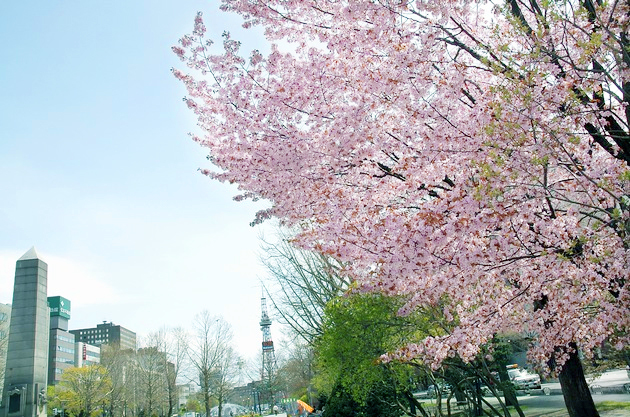 On a clear sunny day, you will have a wonderful time viewing cherry blossoms. There is an area called “Cherry Blossom Forest” in the park. In the area, there are an astounding 2,600 cherry blossom trees. 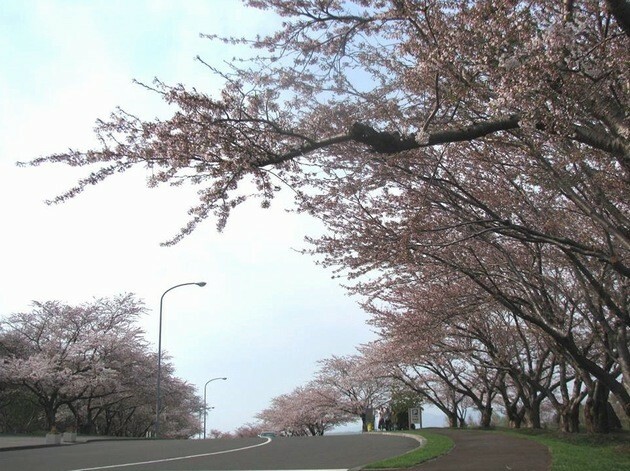 It is one of the largest number of cherry blossom trees in Hokkaido! The playground for children is well-equipped here. The park was designed by the famous interior designer, Isamu Noguchi. The design of the playground equipment was also done by him, offering an unexpected arrangement. If you visit with your family, children would be happy at this place with unexpected playground equipment. It is conveniently reached by car, bus, or taxi! From the Sapporo Municipal Subway Toho Line Sapporo Station, take the train in the direction of Sakaemachi for 6 minutes, alight at Kanjo-Dori-Higashi Station, and transfer to a bus. Open period: Only the East Entrance Gate is open throughout the year. The West Entrance Gate and South Entrance Gate are open only during the period of April 20th-November 20th. Opening hours: (East Entrance Gate) 7:00 a.m. – 10:00 p.m.
(West Entrance Gate and South Entrance Gate) 7:00 a.m. – 7:00 p.m. While the central area of Sapporo is easily accessible, you will encounter rows of buildings as it is downtown. Walking about 10 minutes from JR Sapporo Station, there is a spot where you can leisurely view cherry blossoms away from the tall buildings in the midst of the city. In front of the department of medicine, there is a row of about 30 cherry blossom trees. 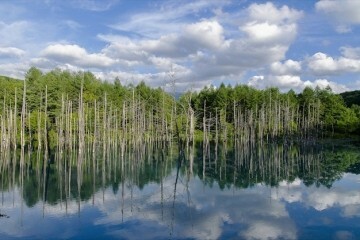 It is about 70 minutes by car from the central area of Sapporo. 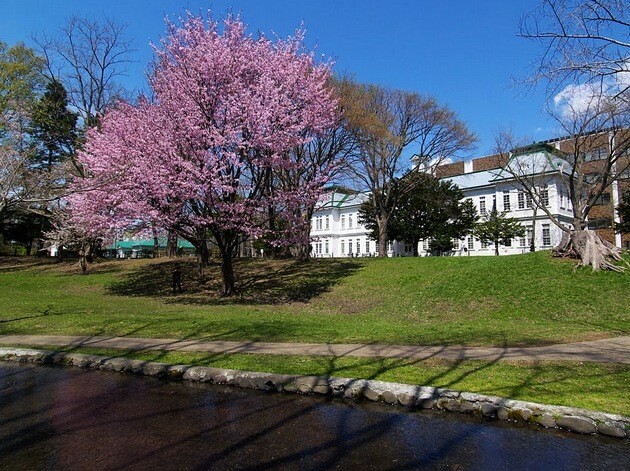 Though it is a little far from the city, we really want you to see the cherry blossoms at Toda Memorial Park. With a total of 8,000 cherry blossom trees, the cherry blossom viewing spot is incomparable to other places. The indescribably beautiful scenery expands in front of you. The challenge is that it is not easy to get to the place, unless by car or bus. If you go by bus, you can get there from the Chuo Bus Sapporo Terminal in Odori-Higashi 1 Chome, for ¥1,070 one way. which lies between “West 1 Chome” and “East 1 Chome” in Sapporo City, in the direction of Ishikari. 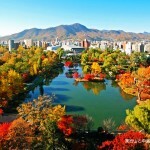 Odori Park is located in the central area of Sapporo. 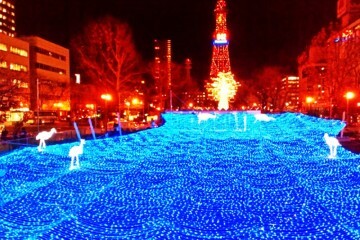 Though the park itself is a regular tourist spot, the famous “Sapporo TV Tower” is in the easternmost part of the park. 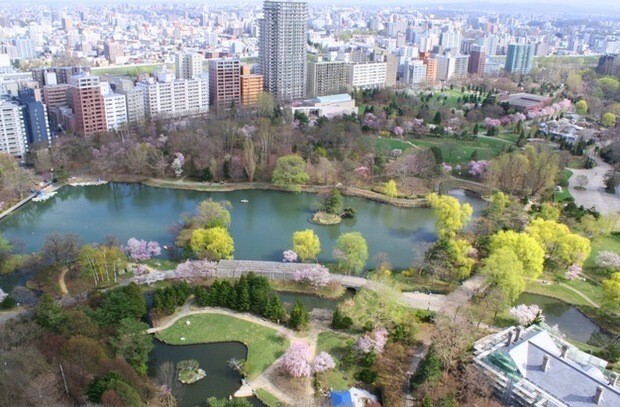 If you were to visit Odori Park to view cherry blossoms, walk westwards, which is the direction away from the TV Tower. The route through West 6 Chome towards the west end of the park, West 13 Chome, is recommended. From Subway Odori Station, it is a distance of 20 minutes on foot to West 13 Chome. 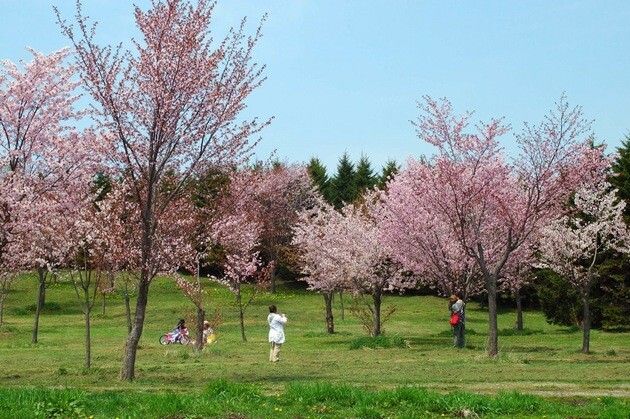 Though some areas have only a few cherry blossom trees, you will not get bored walking around with the presence of fountains, playground equipment, objects, etc. 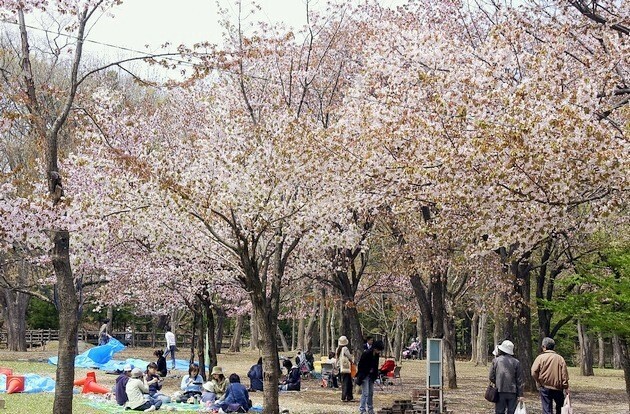 The well-known cherry blossom viewing spot will definitely become packed during the period of full bloom. If you prefer a beautiful cherry blossom viewing spot that does not become crowded, the cherry blossoms at The Civil Engineering Research Institute for Cold Region are recommended. From the Subway Namboku Line Sapporo Station, take the train in the direction of Makomanai for 8 minutes. From Nakanoshima Station where you alight, it takes about 3 minutes on foot. The Civil Engineering Research Institute for Cold Region is also easily accessible from the central area. 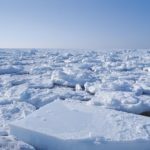 Usually, research on civil engineering technology in the cold region is conducted there. This place usually doesn’t pay attention that much because only staff go there. There are about 200 cherry blossom trees along a small river on the premises. When the cherry blossoms are in bloom, parking on the premises is open to the public every year. However, as spaces are limited, you might be better to use public transportation. Directions: From Sapporo Municipal Subway Namboku Line Sapporo Station, take the train in the direction of Makomanai for 8 minutes, alight at Nakanoshima Station, take Exit 1, and walk for about 3 minutes. 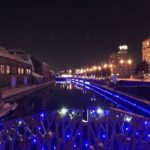 There are a lot more cherry blossom viewing spots in the environs of Sapporo, including famous attractions as well as those off the beaten track. On this occasion, we have introduced 7 attractive spots among them. When you stop by Sapporo from late April-early May, we hope that you will also enjoy viewing the cherry blossoms.